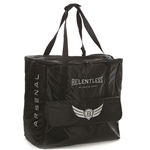 This rope bag has a durable polyester exterior and includes a heavy-duty zipper and an outside pocket. Our Kid Rope Bag is capable of comfortably holding three Kid Ropes. It measures 12? tall x 12? wide x 4? deep. The Ultra Lite Rope Bag is made with durable polyester and has a heavy padding with a burlap lining. The main zippered compartment holds up to four ropes. It measures approximately 19" tall x 19" wide x 3" deep. Our Cactus Kid Gift Pack consists of a Kid Rope, a kid?s glove, a Cactus Ropes bumper sticker and a Pee Wee Rope. All items are packaged in a transparent, reusable bag. 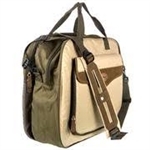 Our Choice Plus Bag has two main compartments. The front compartment has two dividers and the back compartment has a mesh bottom. It has two carrying handles and a shoulder-sling. The front features a large zippered pocket that has a hook and loop closure. It measures approximately 21" tall X 21" wide x 11" deep.